Discernment is very practical. It is not about “feeling spiritual” as we often imagine it. 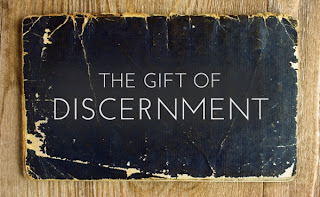 Rather, discernment is about feeling tired or rested, about your schedule at work, arguments with family, what you eat, whether you choose to go out or watch TV. The moments of the present day are the moments when we make choices. And all of the choices that result from our human freedom are healthy or unhealthy, more for God's praise or more for our own ego. Ignatius gives us two terms to deepen our understanding of our own emotional life: consolation and desolation. Underneath and interwoven with our happiness, sadness, anger or peace is a more basic disposition. Consolation is the experience of greater faith, hope, and love for God and neighbour. Desolation is the experience of lesser faith, hope, and love. The signs of consolation are feelings and actions that show God's love in the world, the fruits of the spirit. These fruits could be anything at all, from a day of charitable works to simply enjoying the taste of one's dinner; consolation leads to peace at a deep level. Desolation is marked by choices that are less good, often markedly less conscious and more reactionary, leading to lack of peace. Consolation and desolation are states of our souls. Everyone moves from one state to another and back as time goes on. Consolation and desolation are not to be confused with happiness and sadness. I may be quite sad at a funeral of a loved one, yet feel a greater peace and closeness to God. I may be feeling a surface happiness from skipping out on an obligation, but actually disturbed and unpeaceful underneath if I did not make the choice out of love. St. Ignatius tells us that both consolation and desolation may be hard or easy at different times. Consolation can be hard or easy. Desolation can be hard or easy (see chart). A life of faith and love can be hard, requiring effort and pushing us through experiences of loss or struggle. The mark of consolation in hard times is a continued willingness to bear all with Christ and a resolution to love, no matter what comes. The same resolution occurs when the consolation is easy: life isn't all hardship. Life is given to be enjoyed and its enjoyment can lead us closer to God. Desolation in hard times is marked by a focus on the self: hurtful guilt rather than healthy sorrow for sin, or fear or resentment of the causes of hardship. Desolation isn't all hardship either. Easy desolation may involve indulgent abuse of pleasures rather than healthy enjoyment of them, or selfish pride when things are going well. In easy times and hard, we can be led closer to or further from God. These deep feelings are complex – but they can be navigated with the help and guidance of the Spirit in prayer. No matter what happens, prayer is vital. Prayer is the way to discern consolation and desolation. Whether times are easy or hard, prayer helps. Ignatius teaches us to pray first for light and guidance from the Holy Spirit so that we may truly understand the feelings and choices of the day. In prayer, we experience God's unconditional love for us, which gives us the freedom to be honest with ourselves. In this light, we can see whether we are in consolation, led to greater love of God, or in desolation, somehow resistant to God. In either case, it's good to know where you are. Ignatius compares God to a drop of water. When we are in consolation, we are like a sponge which gently allows the drop of water in. When we are in desolation, we are like a stone that feels the drop of water as an external impact. Knowing where we are, we can give thanks for consolation and ask for help in desolation. Desolation is not a fault to fight in ourselves; rather it is simply the state we are in sometimes. We do not “overcome” desolation – rather, when we notice it we are encouraged to pray more intensely for God's help and grace, to renew the spark of our desire for God and to choose what brings us closer to God as best we can. Nor is consolation a virtue that we can take credit for. Consolation is a gift, the proper flow of grace through us. I must end with saying that discernment is meant to be a gentle effort, invested over a lifetime. Our understanding of consolation and desolation helps us note the patterns of greater or lesser love in our lives, inviting God to help us see our motives. In times of desolation, God may feel distant and graces may seem absent. Ignatius encourages us to remember that such times cannot last forever and to intensify our prayer that we might truly ask and invite God to be present, realizing that is what we truly want. In times of consolation, God may feel present and life-giving. St. Ignatius advises us to give deep and profound thanks to the true source of our joy and peace. In all of these experiences, the hard and the easy, the desolate and the consoling, we experience God's love helping us to grow. Great post! It is so clear and concise, and the discernment of the spirits is so methodological. =) I rarely print blog posts, but I think this one was really well written and will be keeping a hard copy for future reference! P.S. To all the dear bloggers on this site: the idea to write a series on Ignatian spirituality is a great idea! Cheers. Thanks very much, Joyce! It means a lot to me.